This article uses the CData ODBC driver for Salesforce to import data in Excel with Microsoft Query Query. This article also demonstrate using parameters with Microsoft Query. The CData ODBC Driver for Salesforce uses the standard ODBC interface to link Salesforce data with applications like Microsoft Access and Excel. Follow the steps below to use Microsoft Query to import Salesforce data into a spreadsheet and provide values to a parameterized query from cells in a spreadsheet. See the "Getting Started" chapter in the help documentation for a guide to using the ODBC Data Source Administrator to configure the connection to Salesforce. 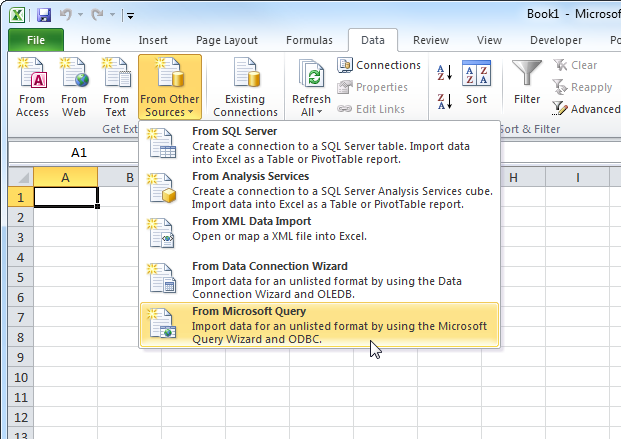 In Excel, open the Data tab and choose From Other Sources -> From Microsoft Query. Choose either the 32-bit DSN or 64-bit DSN, depending on the version of Microsoft Office installed on your machine. Select the option to use Query Wizard to create/edit queries. 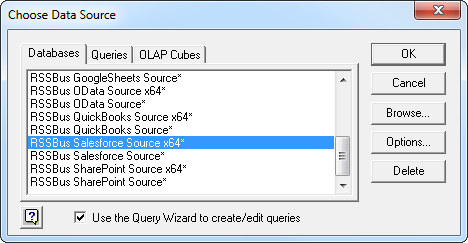 In the Query Wizard, expand the node for the table you would like to import into your spreadsheet. Select the columns you want to import and click the arrow to add them to your query. Alternatively, select the table name to add all columns for that table. 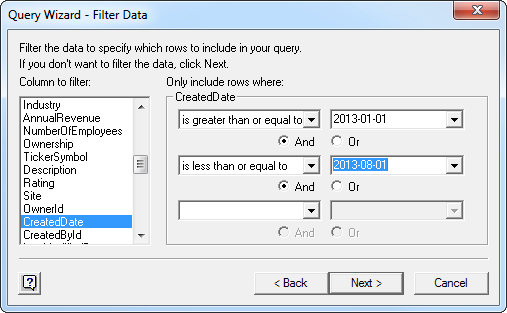 The Filter Data page allows you to specify criteria. For example, you can limit results by setting a date range. 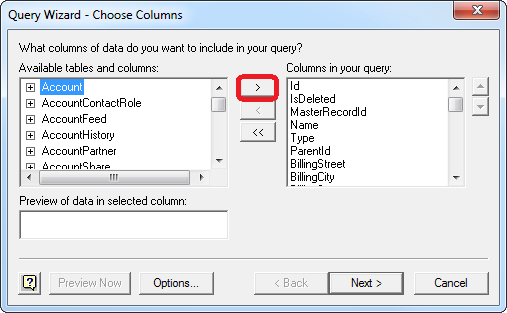 If you want to use parameters in your query, select the option to edit the query in Microsoft Query. To set a parameter in the query, you will need to modify the SQL statement directly. To do this, click the SQL button in the Query Editor. If you set filter criteria earlier, you should have a WHERE clause already in the query. To use a parameter, use a "?" character as the wildcard character for a field's value in the WHERE clause. For example, if you are importing the Account, you can set "Industry=?". Close the SQL dialog when you are finished editing the SQL statement. You will be prompted to enter a parameter value. 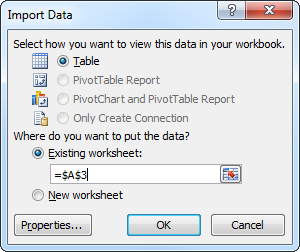 In the next step, you will select a cell to provide this value. So, leave the box in the dialog blank. Close Microsoft Query. The Import Data dialog is displayed. Enter a cell where results should be imported. Close the Import Data dialog. You will be prompted to enter a parameter value. Click the button next to the parameter box to select a cell. Select the option to automatically refresh the spreadsheet when the value changes. The data is now imported into Excel. When you change the value in cell B1, the data will be filtered by the specified search criteria.